Centric offers two styles of the carbide and backer knife system; Standard carbide and backer and Euro carbide and backer. Before we move on to the differences and benefits of the standard and euro carbide and backer systems; it is important to understand the difference in applications between the carbide and backer systems and a carbide inlayed high speed steel knife. When cutting a “clean” material (such as wood with no mineral pockets or knots) it is best to use one of the carbide and backer systems. A carbide inlayed knife would be best used on materials that have inconsistencies that will vary the resistance the knife will have to cut though-out the run. Another difference in application for carbide and backer systems vs carbide inlayed knife is that a Centric Inc. carbide inlayed knife has a maximum inlay of 35mm of carbide. This restricts the depths of profile you are able to grind into a carbide inlayed knife. If the profile you want to cut is deeper than 1 ¼” then it will exceed the depths of carbide in an inlayed knife. In addition to being able to accommodate deeper profiles carbide and backer systems are able to be sharpened more times than an inlayed knife. By moving the carbide up one corrugation it increases the overall life of the carbide and backer because it allows you to sharpen and reuse the same knife longer than a profiled inlayed knife. It is notable that a carbide inlayed knife will stay sharper longer and are more durable that their carbide and backer counterparts. Being able to move the carbide up a corrugation on the backer to be sharpened allows for more re-sharpening and therefore longer overall life. 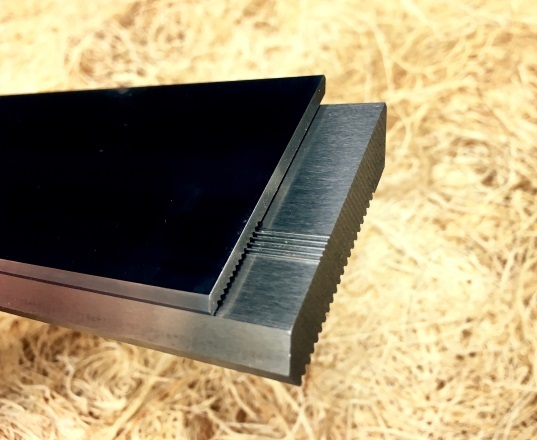 Pictured below you can see that the standard carbide and backer system has a squared edge and the euro carbide and backer is beveled on the edge. The euro system is beveled to better fit your Weinig USA moulder head. You can also see that the standard carbide and backer system has corrugations the entire length of the carbide and bottom side of the high speed steel, where as the euro carbide and backer ststem only has partial corrugations on the carbide and bottom side of the high speed steel. The reason for this is based completely in preference of the operator. 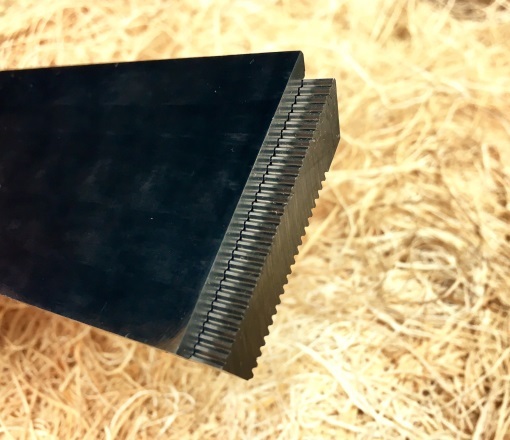 The euro style carbide and backer system is only partially corrugated because it allows the person who is grinding the profile to have a smooth surface on the carbide, which results in a more accurate cutting profile of the knife. The standard carbide and backer system may be less convenient in the grinding process it does have a thicker piece of carbide than the euro system. In summary of this point; Euro style is slightly easier to grind and the standard style has slightly more durable carbide.